Increase your cold-weather comfort with our fleece-lined ArmorSkin® Winter Base Shirt. Winter Base, when paired with ArmorSkin®, gives you warming power, while also increasing your range of motion and access to your equipment by eliminating the need for heavy and cumbersome outerwear. 100% Polyester lined with moisture-wicking 215 gram micro-fleece is warm yet breathable, for use indoors and out during the colder months. Fully fleece-lined body and torso keeps you warm like your favorite fleece jacket, with more range of motion. Maintain your tactical advantage with unobstructed access to your duty belt and equipment. 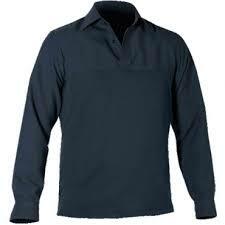 Designed to look like a Class A or B uniform shirt when worn under ArmorSkin. Color matched to Blauer shirting and pant fabrics for a uniform appearance.